Swami Vivekananda was an Indian monk. He is well known for generating awareness in Hinduism and spreading philosophies of Vedanta and yoga to the western world…. Swami Vivekananda’s earlier name was Narendranath Datta. He was born in Calcutta in an aristocrat Bengali family on 12 January 1863. At that time India was under the British rule and Calcutta was the capital of India. His father Vishwanath Datta was an attorney of Calcutta High Court and his mother was a housewife. Vivekananda was an average student but he has a great interest in reading books. He had great interest in the Vedas, the Upanishads, the Bhagavad Gita, the Ramayana, the Mahabharata and the Puranas. Narendranath studied in the institution Ishwar Chandra Vidyasagar. Later he passed Entrance exam from Presidency College. He also studied western history and western philosophy from the Scottish Church College. He completed his Bachelor degree in 1884. Vivekananda became a member of Brahmo Samaj, where he got the thoughts about formless god. Vivekananda always used to ask people about their idea of god and religion, but their answers didn’t satisfy him. He got his answers from Ramakrishna. He met Ramakrishna for the first time in November 1881. It was the turning point of his life. He made Ramakrishna his guru. Ramakrishna died on 16 August 1886. Ramakrishna taught Vivekananda that service to men was the most effective worship of God. After the death of Ramakrishna, Vivekananda took the responsibility of the Ramakrishna’s Cossipore Math. He transferred the math to Baranagar. In 1899 Baranagar math was transferred to Belur. This is now known as Belur Math. 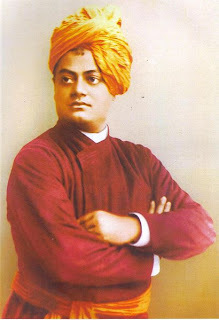 The name Vivekananda was given to Narendranath by Ajit Singh, Maharaja of Khetri. Vivekananda started wandering in India from 1888 (as a Parivrâjaka: a ritual of Hindu religion). He wandered all around the India about five years and lived with different kinds of people. Vivekananda visited Chicago on July, 1893. At that time Parliament of the World's Religions was organizing there. But due to lack of credential at first he was not given the opportunity to speak. But with the help of Professor John Henry Wright of Harvard University he got the opportunity to speak. On 11 September 1893 at the Parliament of the World's Religions, he gave his first brief speech on Hinduism. He began his speech with “Sisters and brothers of America!”. With this speech he got the standing ovation from the seven thousand people gathered there. After the speech of Chicago, he gave many speeches all around the world and met with many people. Such as Sister Nivedita, Max Muller, Paul Deussen and many more people. He returned to India in 1897. In India he also gave many speeches. He gave speeches on social issues. His speeches had a great effect on the leaders of that time (Mahatma Gandhi, Subhas Chandra Bose). He founded Ramakrishna Mission on 1 may, 1897. In 1899, despite of his bad health he visited the west for the second time. In this visit he established Vedanta societies at San Francisco and New York, Shanti Ashrama (peace retreat) at California. He has written many books- Karma Yoga (1896),Raja Yoga (1896), Vedanta Philosophy: An address before the graduate philosophical society (1896), Lectures from Colombo to Almora (1897), Addresses on Bhakti Yoga, Bhakti Yoga, The East and the West. On 4 July 1902 Swami Vivekananda died at Belur Math at an age of 39. His birthday is celebrated as a National Youth day in India.